From once firm allies, the Dutch Republic and England would become bitter rivals. This led to three wars that were fought across the course of the seventeenth century. One legacy of of these conflicts can be found in the English language, which includes a number of what are effectively anti-Dutch slurs. One example is the expression “Dutch courage,” which refers to strength or courage gained only through intoxication. Throughout this time, Amboyna remained a powerful symbol of Dutch perfidy and it would be revived again and again whenever anti-Dutch sentiment was on the rise. Amboyna thus became a useful political tool long after everyone involved in the original trial had died. 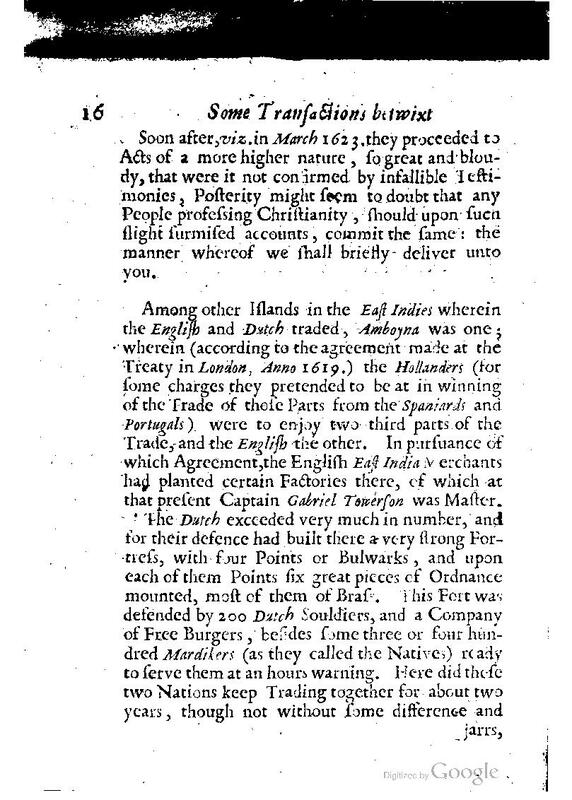 This extract comes from a pamphlet printed in 1664 so four decades after the Amboyna conspiracy trial. The subtitle, "how far the English engaged in their defence against the most potent monarchy of Spain, and how ill the Dutch have since requited the English for their extraordinary favours, not onely in the time of Queen Elizabeth their protector and defendress, but also in the time of King James, by their bloody massacree of them at Amboyna, their ingratitude to King Charles the First of glorious memory, and the true state of affairs as they now stand in the reign of our royal soveraign King Charles the Second / by a true lover and asserter of his countries honour", gives you a good sense of the content which damned the Dutch in vicious terms. The authors suggest that it is impossible to believe that "any People professing Christianity" could act in this way. Pamphlets like this served to fan the flames of ongoing controversy.